Ganga, which was touted as clean during Kumbh, has black water gushing down at one its ghats in Kanpur. It is effluent coming from tanneries, which were shut during the pilgrimage held in Prayagraj (earlier known as Allahabad) from January 15 to March 4. White foam is rising from the swirling liquid waste as it snakes it way into the Ganga at Dapkeshwar Ghat. Clearly, Kumbh is over. Since Prayagraj is 200-kilometre downstream from Kanpur, the Uttar Pradesh government ordered that all tanneries shut operations till March 15. Also, the state diverted the untreated sewage into treatment plants that are yet to function properly. Mishra is not exaggerating. The river bed is almost dry and Ganga has reduced to a narrow, dark-coloured stream since the Kumbh Mela is now over. 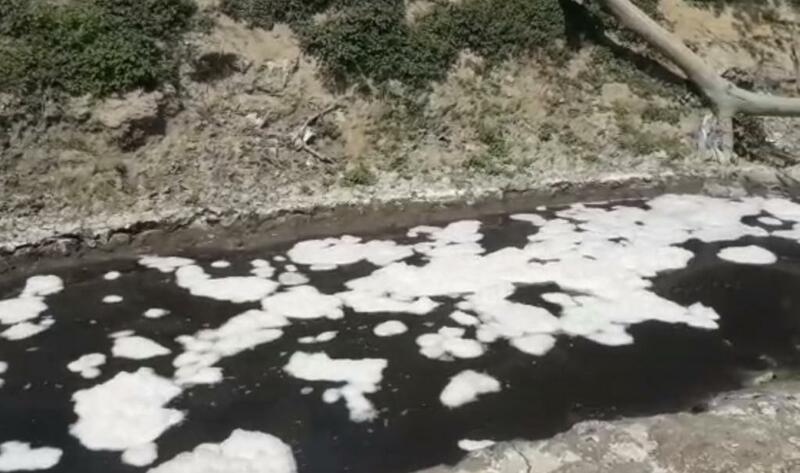 Sources claim tanneries that resumed operations and pollutants are again flowing into the river when the government is yet to order their reopening. “We run our tanneries even during nahaan (auspicious days during Kumbh when pilgrims take a dip in the Ganga). Now Kumbh Mela is over and work has started in mort of the tanneries. We have already suffered a lot financially. We can’t bear more losses,” a tannery owner, on condition of anonymity, told Down to Earth. His tannery is operational but with a reduced strength and just in the nights. This is when pollution control and municipal officials are supposed to strictly ensure that not even a single drain opens into the Ganga during nahaan. Environmentalists believe that tanneries might work extra to make up for the lost time. “If, at Dapkeshwar Ghat, effluent from tanneries is flowing into the Ganga, it means the tanneries have started operating. They will be run overtime to make up for the losses suffered in the last three months and that means pollution in the Ganga will shoot up,” said Rakesh Jaiswal, founder and executive secretary a Kanpur-based non-profit Eco-Friends. Most of the tanneries in Kanpur are in Jajmau industrial area and a major drain in Shitala Bazaar carries waste from these tanneries to the Ganga. This drain had gone dry during the Kumbh Mela. But, it’s now brimming with noxious waste, which has chrome, the most toxic substance in tannery effluent and a carcinogen. Hafizur Rehman, president of Small Tanners’ Association, denies that tanneries are operational. “The gates of my tannery are open for everybody to come and see. We are waiting for the official order,” he told Down to Earth. Moreover, domestic sewage has also started falling into the Ganga. Ghanshyam Agarwal, regional officer of Uttar Pradesh Pollution Control Board (UPPCB) in Kanpur echoes Rehman’s claims. “The officials of the central and state pollution control boards and National Green Tribunal still have to meet and decide about the reopening of tanneries,” he said. He also said no untreated domestic waste was being released into the Ganga. Kanpur generates 430 million litres per day (MLDs) of domestic sewage and it has two sewage treatment plants (STPs) and one common effluent treatment plant (CETP). The two STPs have a combined capacity to treat 135 MLD of sewage. Four new STPs came up recently that have a combined capacity to treat 310 MLDs of sewage. “Around 27 MLD of sewage and nine MLD of tannery effluents are treated in the CETP. So, it is believed that discharge from the tanneries is only nine MLD because there’s no record of this volume,” said Jaiswal. Environmentalists believe the Ganga can be cleaned if the volume of water in the river is increased. They say since it works for Prayagraj, it should work for Kanpur too. “Only two tributaries — Ramganga and Kalinadi — join the Ganga in her course from the Himalayas to Kanpur. Both are major drains that carry industrial waste. But more tributaries like the Yamuna, Ghaghara, Sharda, Gandak join the Ganga as it flows further southeast through the plains of Bihar and West Bengal. The volume of the water increases and hence pollution decreases,” said Jaiswal. On the directions of the Allahabad high court, Central Leather Research Institute in 2012 had conducted a survey of all tanneries in Jajmau and concluded that the volume of the discharge is close to 50 MLD. It suggested to the state government that Kanpur should have a plant with a capacity to treat at least 50 MLD of effluents. But successive state governments have failed to take any action. “Currently, we are treating only nine MLD of effluents from tanneries. Where is the rest 41 MLD of the noxious waste going?” questions the environmentalist.